This week I’m attending the Orange Conference in Atlanta. I’ve had the privilege of being a workshop presenter for three different sessions. Honored to be associated with this team of amazing game changers for the Kingdom! Proven tools to help you ramp up to Orange! 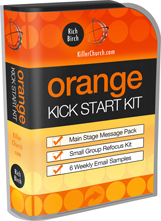 Main Stage Message Pack // Everything you need to give to your Lead Pastor to pull off a “Power of Orange” message.